As a Rhodes scholar at Oxford University, Kate earned a Master’s in the history of science, focusing on exploration and geopolitics in contested mountain borderlands. Earlier she studied biology as a Morehead scholar at UNC-Chapel Hill, and later earned another Master's in geobiology at MIT. Her “Silk Road” project grows from that earlier work but is in no sense planned as an academic treatise. She states: "I am writing a literary nonfiction book that aims to bring the Silk Road’s stunning, complicated borderlands to vivid life in minds and hearts. For this is wilderness conservation’s most crucial project: making people fall in love with wild places, making deserts and mountains more than merely backdrop. Fusing conservation field research with creative nonfiction, and natural history with adventure, this book will throw the contours of the Silk Road’s desert places into sharp relief, and in the process, inspire people everywhere to think beyond borders." The selection committee agreed that among this year’s applicants, “Cycling Silk” was most reminiscent of Ellen Meloy’s work, in its personality, daring, and imaginative scope. Upon receiving the award, Harris said, "Ellen Meloy writes of wild things—herself included—with such dazzle, wit, and wonder. From the astonishing poetry of her words to the soaring, exploring life and spirit they reflect, she is a role model of mine in more than simply a literary sense. I am so honoured to be associated with her legacy through this award." The Ellen Meloy Fund gave its first award of $1,000 in 2006. As the fund has grown, the board has increased the grant award. With news that a $100,000 goal had been reached in 2011, the award went to $3,000 this year. The Ellen Meloy Fund supports writers whose work reflects the spirit and passion for the desert embodied in Meloy’s writing and in her commitment to a “deep map of place.” Before her untimely death in 2004, Meloy published four books, numerous articles, and radio commentaries. Her last book, Eating Stone, won the John Burrows Association Medal for 2007. An earlier work, The Anthropology of Turquoise, was a finalist for the Pulitzer Prize. 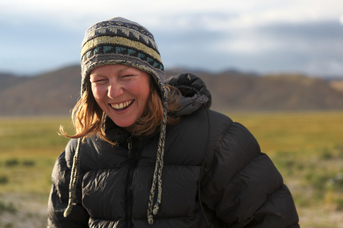 a fool for turquoise - Kate Harris shares what the Desert Writers Award means to her. Visit kateharris.ca to learn more about Cycling Silk.